Mirabaud LX, the 2008 Swiss experimental foiler owned by Thomas Jundt has a new and improved 24m2 wing mast for the 2012 Lake Geneva season. The crew took the foiler for a successful shakedown sail yesterday evening and has its eye on the Lake Geneva records this summer. The 2012 edition of Thomas Jundt’s experimental foiler, sponsored by Mirabaud & Cie since 2008, sailed with its new wing yesterday evening for the first time this season. Thomas Jundt, Antoine Ravonel and Eric Gobet who make up the three-man crew reassembled the boat last weekend after a busy winter of building the wing and maintaining and improving the platform. Mathias Bavaud, a composite specialist based in Yverdon, Switzerland, led the wing modifications, increasing the wing area from the bottom. The 2012 Mirabaud LX goals are to set a number of Lake Geneva records: the kilometre record, the hour record and the ‘Ruban Violet’ (purple ribbon). The team will also race the Geneva-Rolle-Geneva, the Bol d’Or Mirabaud, the Six Hours of Nernier and the Versoix Double. The shore crew has been bolstered with the addition of a weather boat that will collect data during the training sessions to analyse and improve performance. 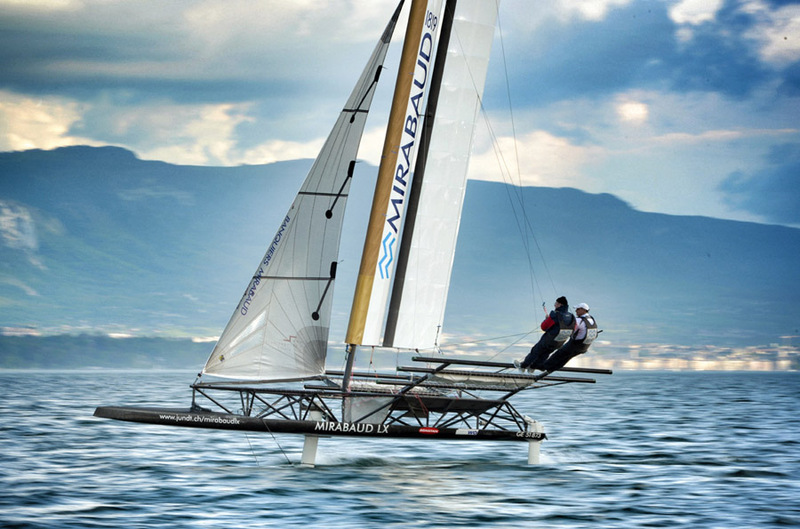 Philippe Baraud, a sailor and the co-founder of the Regatta Training Centre, will lead this project.